The following software is freely available. However, if you use it for published research, you are requested to cite the paper where the method is described, highlighted in red. You are not allowed to re-distribute any of these programs (modified or not) without explicit permission from the author. NOTE: If you are just starting to program and are wondering which version you should use, I strongly recommend the Python version of my programs. LOESS: to uncover mean trends from noisy one-dimensional or two-dimensional data using the LOESS approach. AdaMet: An Adaptive Metropolis package for Bayesian analisys. My packages above are on the Python Package Index (PyPI). Illustration of the steps involved in the MGE fit to the S0 galaxy NGC 4342 using the MgeFit package. The figures were produced by the mge_fit_example.py script included in the Python distribution of the software. This software obtains an accurate Multi-Gaussian Expansion (MGE) parameterizations (Emsellem et al. 1994; Cappellari 2002) for a galaxy surface brightness with the fitting algorithm of Cappellari (2002, MNRAS, 333, 400). Given that Gaussians are not orthogonal functions, MGE fits are in general strongly degenerate, with difficult global convergence, but the MGE_FIT_SECTORS method solves all problem, making MGE fitting an automated, reliable and robust process. See Cappellari et al. (2006) for a large scale application of this software to the study of the M/L ratio and the Fundamental Plane of early-type galaxies and Cappellari et al. (2012, Nature) for an application to the study of the stellar IMF. The MGE parameterizations is useful in the construction of realistic dynamical models of galaxies (see JAM modelling below), for PSF deconvolution of images, for the correction and estimation of dust absorption effects, or for galaxy photometry. 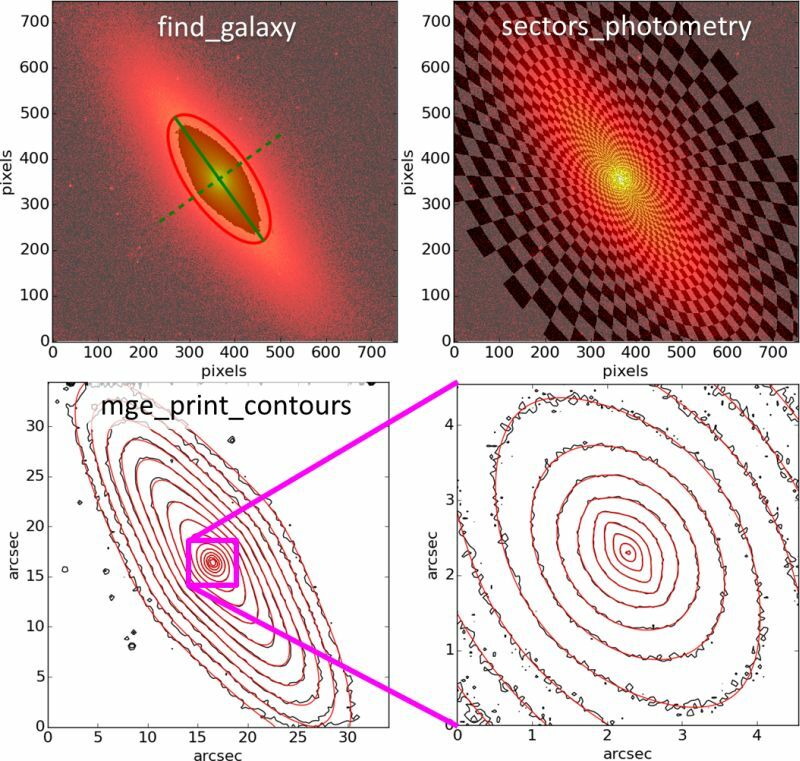 The source code of the MgeFit package, including four test galaxy images, is on the Python Package Index (PyPI). It was last updated on the 21 May 2018. It is typically about 5× faster than the IDL one due to the use of SciPy's built-in NNSL procedure and NumPy's broadcasting. It is orders of magnitude faster when using the option linear=True, which is now always recommended with Python. How to install: Use "pip install mgefit". Without write access to the global site-packages directory, use "pip install --user mgefit". Usage examples: are in the directory "examples" inside the main package folder inside site-packages. MgeFit requires the scientific core packages NumPy, SciPy and Matplotlib, and the examples use Astropy to read FITS images (it was tested with Python 3.7 using NumPy 1.15, SciPy 1.2 and Matplotlib 3.0). Also included in the MgeFit package is the mpfit implementation by Markwardt (2009) of the MINPACK (Moré, Garbow & Hillstrom, 1980) Levenberg-Marquardt nonlinear least-squares optimization algorithm. The mpfit routine was translated into Python by Mark River and updated here for NumPy by Sergey Koposov. I modified the latter version to support Python 3 and fixed some numerical instabilities. Note that MgeFit uses the mpfit implementation instead of the SciPy.optimize.least_squares one, because of the ability of mpfit to tie parameters or keep them fixed. Like all major public packages, I pledged to drop support for legacy Python 2.7. If you are still using it, the last version supporting it is still available here (tested with NumPy 1.14, SciPy 1.1 and Matplotlib 2.2). To install it, copy the package folder to a directory in the Python path. The source code of the IDL package MGE_FIT_SECTORS, with examples and instructions, can be downloaded here in ZIP format (338 KB). This version was last updated on the 21 November 2017 and the changes are documented in the program file. Optionally the FITS files of the five galaxy images that are required to run the examples routine can be downloaded here in ZIP format (19 MB). The MGE_FIT_SECTORS package was tested with IDL from 6.4 to 8.6. The Bounded-Variables Least-Squares (BVLS) algorithm by Lawson & Hanson (1995). This is a generalization of the Non-Negative Least-Squares (NNLS) algorithm by the same authors. My IDL routine bvls.pro can be found here. Also included in the MGE_FIT_SECTORS distribution is the MPFIT implementation by Markwardt (2009) of the MINPACK (Moré, Garbow & Hillstrom, 1980) Levenberg-Marquardt nonlinear least-squares optimization algorithm, with some specific modifications to make it work robustly with MGE_FIT_SECTORS. And if you just started using IDL and still do not have the IDL Astronomy User's Library installed, or if you have an old version, you should immediately get it from here. NOTE: I would appreciate if you drop me an e-mail (address at the bottom) when you download the above procedures. I would also like to know if you got the IDL or Python version. Figure 1: Examples of JAM data-model comparisons. The bi-symmetrized SAURON stellar kinematics of 6 Elliptical (left) and 6 S0 (right) fast-rotator early-type galaxies is compared to the predictions of the anisotropic Jeans models with JAM. The kinematics varies widely for different galaxies, yet these two-parameters (!) models are able to correctly predict the shape of a pair of two-dimensional functions (V and Vrms), once the observed surface brightness is given (this is fig.10 of Cappellari 2016, ARA&A). Figure 4: Validating black hole (BH) recovery with JAM. A detailed JAM modelling accurately recovers the "benchmark" BH mass in NGC4258, as inferred from maser observations (figure taken from Drehmer et al. 2015). 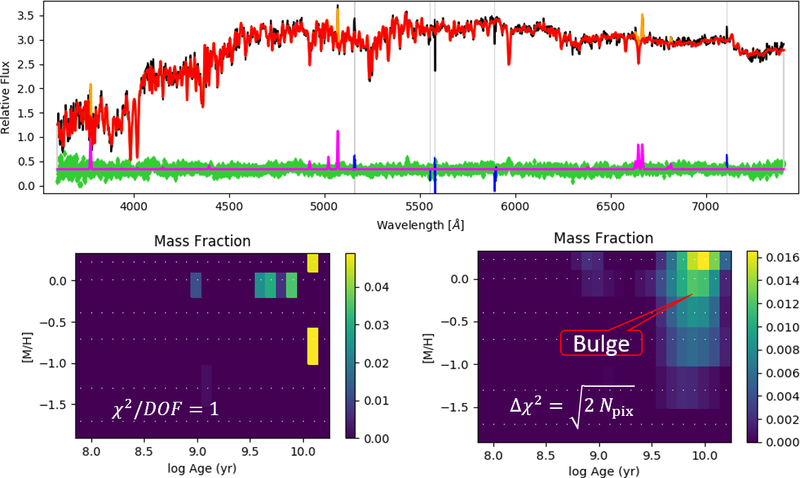 An equally good agreement was found with JAM for the "benchmark" BH in the Milky Way (Sec.4.1.2 of Feldmeier-Krause et al. 2017). Other successful BH comparisons, between JAM and Schwarzschild's method, were presented e.g. in Cappellari et al. (2010), for 25 galaxies, and Krajnović et al. (2018), for 7 galaxies. Figure 3: JAM models examples of kinematically decoupled components. 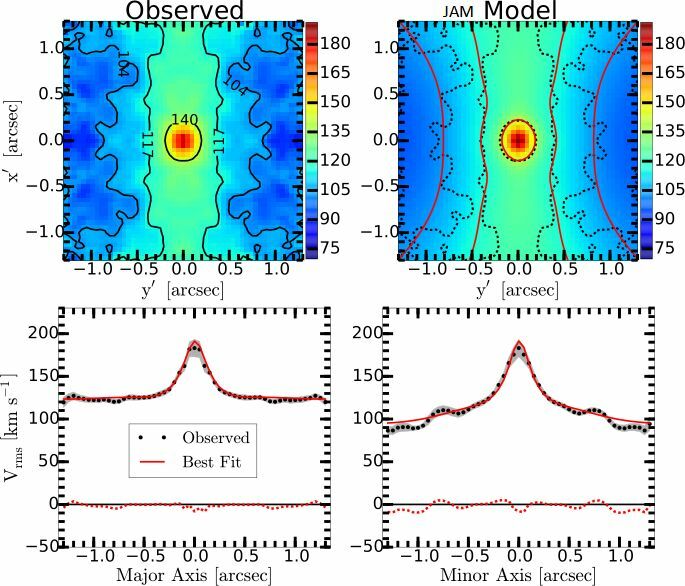 (a) Three-parameters JAM description of the SAURON stellar kinematics of the early-type galaxy NGC4550, which contains two counter-rotating stellar disks (Cappellari et al. 2007). To reproduce the observed velocity field, the flattest (q' < 0.25) Gaussians of the MGE model were assigned opposite rotation (κ < 0). (b) Same as in [a] but with the model orbits all rotating in the same direction. (c) Best fitting JAM model of NGC5308, with constant anisotropy (βz = 0.28 and κ = 1.02) (Cappellari 2008). (d) Same as in [c], but with a non-rotating bulge (κ = 0). (e) Same as in [c] but with an isotropic bulge (βz = 0) and an anisotropic disk (βz = 0.28). The best model has an oblate velocity ellipsoid, with the same strong anisotropy and the same rotation for both the bulge and the disk! The software in this section implements in Python and in IDL a solution of the Jeans equations which allows for orbital anisotropy (three-integrals distribution function) and also provides the full second moment tensor, including both proper motions and radial velocities, for both axisymmetric (Cappellari 2012) and spherical geometry (Cappellari 2015). The technique was introduced in Cappellari (2008, MNRAS, 390, 71) and we call it the Jeans Anisotropic Modelling (JAM) method. 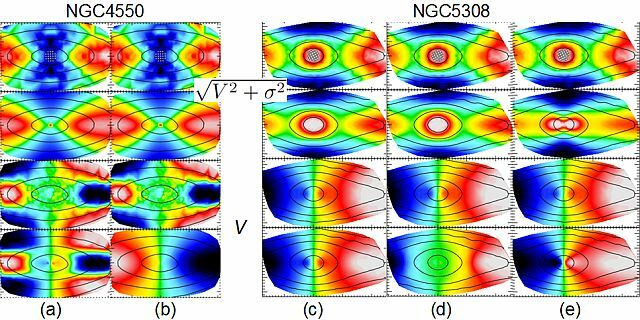 It relies on the Multi-Gaussian Expansion parameterization (Emsellem et al. 1994; Cappellari 2002) for the galaxy surface brightness. With the addition of a single extra parameter βz=1-(σz/σR)2, the simple and user-friendly three-integrals JAM method already provides a dramatic improvement over the classic but less general two-integrals f(E,Lz) Jeans (1922) models. However JAM also allows for tangential anisotropy γ=1-(σφ/σR)2 and/or for spatially varying anisotropy. The JAM models provide a remarkably good descriptions of state-of-the-art integral-field stellar kinematics of real galaxies (Figure 1). This makes the technique well suited to measure the inclination, the dynamical M/L and angular momenta of early-type fast-rotators and spiral galaxies. To construct dynamical models with the JAM method one needs to describe the galaxies surface brightness via the Multi-Gaussian Expansion parametrization using my MGE_FIT_SECTORS package above. 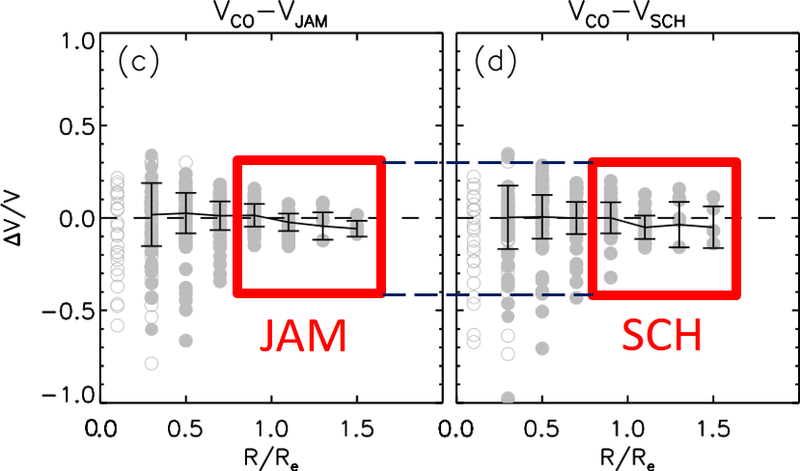 Figure 5: JAM works even better than Schwarzschild on real galaxies. An extensive and detailed comparison between the circular velocity VCO measured from CO gas and the corresponding circular velocity VJAM and VSCH inferred from dynamical modelling of integral-field stellar kinematics using the JAM and Schwarzschild's (SCH) methods, for 54 real disk galaxies with CALIFA data, found that JAM recovers the galaxy densities more accurately than SCH (this is Fig.8 from Leung et al. 2018). The smaller JAM scatter is particularly evident at large radii (inside the red boxes), where the gas Vc is better determined. The source code of the JamPy package is on the Python Package Index (PyPI). It was last updated on the 14 February 2019 and the changes are documented in the program files. The Python version of the mean velocity calculation is about 30× faster than the IDL version, due to a redesign of the double integration approach, made possible by NumPy's broadcasting. How to install: Use "pip install jampy". Without write access to the global site-packages directory, use "pip install --user jampy". Usage examples: are in the directory "examples" inside the main package folder in site-packages. Also required is my plotbin package (automatically installed by pip). The JamPy package requires the scientific core packages NumPy, SciPy and Matplotlib (it was tested with Python 3.7 using NumPy 1.15, SciPy 1.2 and Matplotlib 3.0). The source code of the JAM modelling package in IDL, with documentation and examples, can be downloaded here in ZIP format (45 KB). This version was last updated on the 19 October 2017 and the changes are documented in the program files. The JAM package was tested with IDL from 6.4 to 8.6. Also required are the generic plotting routines SAURON_COLORMAP and PLOT_VELFIELD which can be found in this ZIP file. Note that the JAM Python code is extremely well vectorized. You should not assume the C version will be significantly faster without benchmarking with identical setup. Laura Watkins has translated the JAM procedures into the C language. Her code is available here. 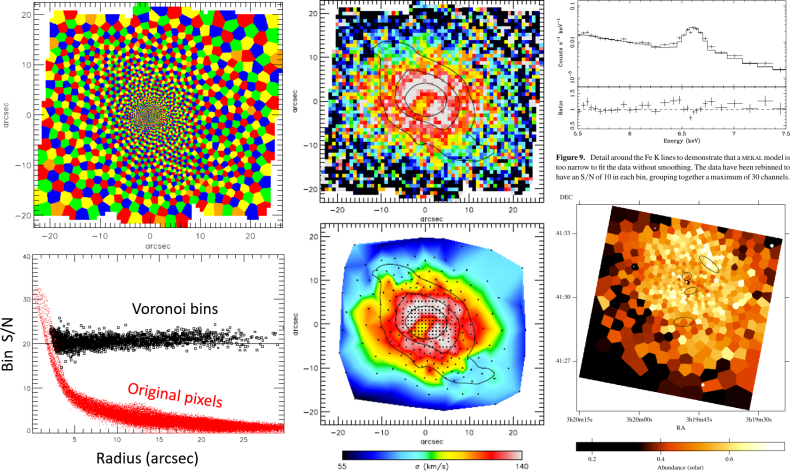 Left: Four-coloring of Voronoi binning; Middle: Unbinned versus Voronoi binned stellar kinematics from Integral-Field Spectroscopy (Cappellari & Copin 2003); Right: Voronoi binning of abundance from X-ray data (Sanders et al. 2004). The Voronoi Binning method of Cappellari & Copin (2003, MNRAS, 342, 345) optimally solves the problem of preserving the maximum spatial resolution of general two-dimensional data (or higher dimensions), given a constraint on the minimum signal-to-noise ratio. The Voronoi binning method has been applied to a variety of types of data. A review of the concepts and applications to (i) X-ray data, (ii) integral-field spectroscopy, (iii) Fabry-Perot interferometry, (iv) N-body simulations, (v) standard images and (vi) other regularly or irregularly sampled data is given in Cappellari (2009). The source code of the VorBin package, with examples and instructions, is on the Python Package Index (PyPI). It was last updated on the 21 May 2018 and the changes are documented in the program files. How to install: Use "pip install vorbin". Without write access to the global site-packages directory, use "pip install --user vorbin". Usage example: is in the package folder inside site-packages. The VorBin package requires the scientific core packages NumPy, SciPy and Matplotlib (it was tested with Python 3.7 using NumPy 1.15, SciPy 1.2 and Matplotlib 3.0). My optional plotbin package contains routines to visualize Voronoi 2D-binned or unbinned data like in the figures above. The source code of the IDL program VORONOI_2D_BINNING, with examples and instructions, can be downloaded here in ZIP format (75 KB). This version was last updated on 10 October 2017 and the changes are documented in the program file. Some minor adaptations of the routine may be required to optimally use the method with different types of data. Please ask for suggestions if needed. VORONOI_2D_BINNING was tested with IDL from 6.4 to 8.6. This optional ZIP file contains the routines display_bins, display_bins_generators, DISPLAY_PIXELS, PLOT_VELFIELD and SAURON_COLORMAP which can be used to visualize Voronoi 2D-binned or unbinned data, either using interpolation, or by showing the actual bins like in the figures above. Figure 1: Stellar and gas kinematics fit with pPXF. The black line (mostly hidden by the fit) is the relative flux of the observed spectrum. The red line is the pPXF fit for the stellar component, while the orange line is a fit to the gas emission lines. The green symbols at the bottom are the fit residuals, while the blue lines is the gas-only best-fitting spectrum. The main absorption and emission features are indicated at the top of the plot (taken from Cappellari 2017). Inclusion of covariance matrix: To account for correlated errors in the spectral pixels (e.g. due to rebinning and interpolations). See Emsellem et al. (2004) and Cappellari et al. (2011) for two large-scale applications of the pPXF method to the measurement of the stellar kinematics of galaxies. Cappellari et al. (2009) use pPXF to measure velocity dispersion of a sample of 9 passive early-type galaxies at redshift z~2. MILES Library of Stellar Spectra: 985 well-calibrated stars covering the region from 3525 - 7500 Å at a spectral resolution of 2.51 Å (FWHM), σ~64 km/s, R~2000. From Sánchez-Blázquez, et al. (2006) and Falcón-Barroso et al. (2011). Figure 2: Star-formation history with pPXF. 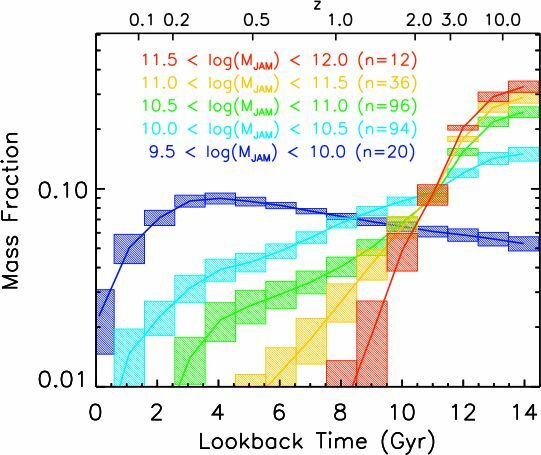 The plot shows the star-formation history of ATLAS3D galaxies, in bins of different galaxy stellar mass. This was recovered with pPXF using regularization (taken from McDermid et al. 2015). Figure 3: Population and gas with pPXF. The plots show the pPXF fit to two MaNGA spectra for the spiral galaxy NGC2916 (from SDSS DR13). 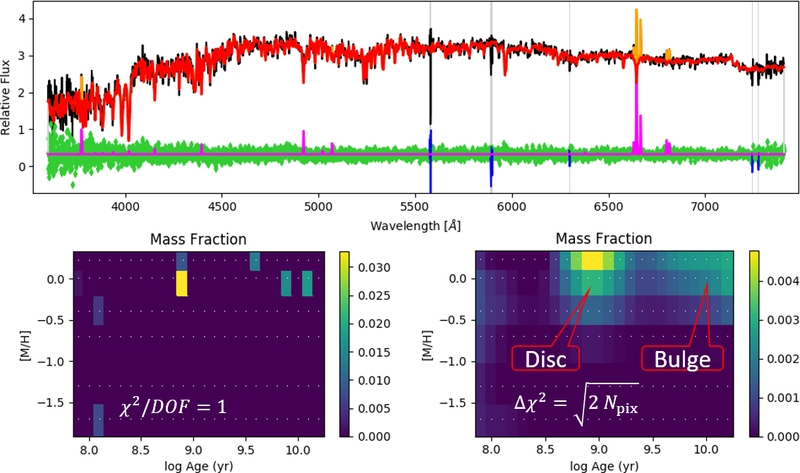 The Left Spectrum is located in the galaxy bulge, while the Right Spectrum is in the disk. The "Mass Fraction" maps, below each spectrum, show the corresponding pPXF solution in different age and metallicity intervals. The Left Maps have no regularization. These are the minimum χ2 solutions which all non-regularized full-spectrum fitting programs must return, if they properly converge. However these solutions are noisy and arbitrary as this inverse problem is ill-posed. Regularization is a standard approach to solve ill-posed problems (see Cappellari 2017, Sec.3.5). The Right Maps show the pPXF regularized solutions: here one can clearly recognize the change in the relative contribution of bulge (∼10Gyr) and disk (∼1Gyr) stars at the two spatial locations. The fits used as templates a subset of 24(Ages)×6([M/H])=144 MILES model spectra by Vazdekis et al. 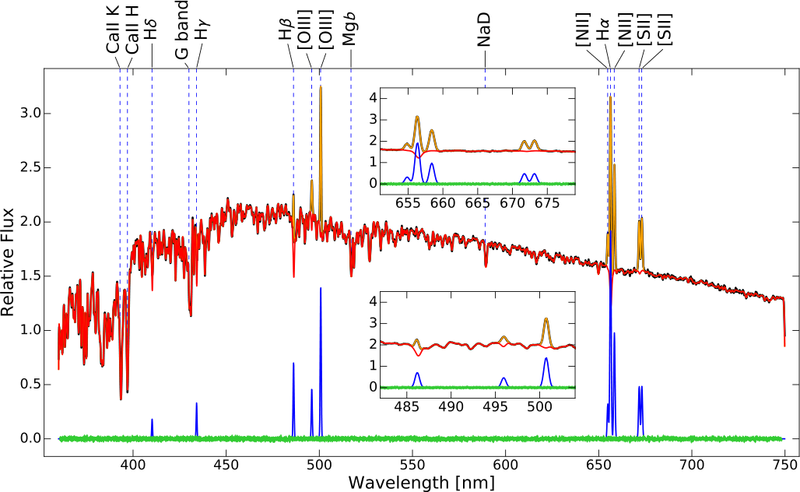 (2010), and 12 gas emission lines. When one uses as input templates a set of synthetic galaxy spectra, arranged in a grid of population parameters (e.g. age and metallicity), pPXF is the most efficient and reliable public implementation of the so called "Full-Spectrum Fitting" method to study stellar populations. This technique has replaced the traditional use of line-strength indices, due to the availability of high-quality model spectra (e.g. Bruzual & Charlot 2003; Vazdekis et al. 2010; Maraston & Stromback 2011; Conroy & van Dokkum 2012). pPXF allows one to extract multiple kinematic components, with different stellar populations, from a spectrum. Gas emission lines can be fitted simultaneously, avoiding the need for masking them. This is particularly useful when studying the stellar population of galaxies with prominent emission lines filling important absorption features (see Figures 1 and 3). Please also cite the source of the MILES stellar population models (Vazdekis et al. 2010) if you use pPXF with the included library of spectral templates. A number of similar, but less optimized and less general implementations of the Full Spectrum Fitting method exist (e.g. STARLIGHT by Cid Fernandes et al. 2005; STECMAP by Ocvirk, et al. 2006; VESPA by Tojeiro et al. 2007). 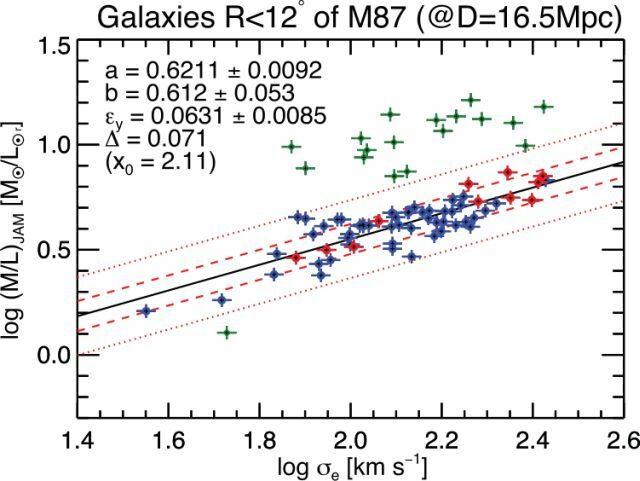 A major limitation of most available codes is that they ignore the fact that the recovery of the star formation history and chemical composition distribution from the galaxy spectra is an ill-posed problem. A standard technique to solve ill-posed problems is regularization (see Cappellari 2017, Sec.3.5), which is invoked in pPXF via the keyword REGUL. Regularization is essential to make sense of the derived star formation histories and to explore model degeneracies (see Figure 2 and 3). The regularized solution has a simple Bayesian interpretation: it represents the most likely solution for the weights, given an adjustable prior on the amplitude of the fluctuations. See Cappellari et al. (2012, Nature) for a pPXF study of the M/L and IMF of stellar populations, and figure 20 of Onodera et al. 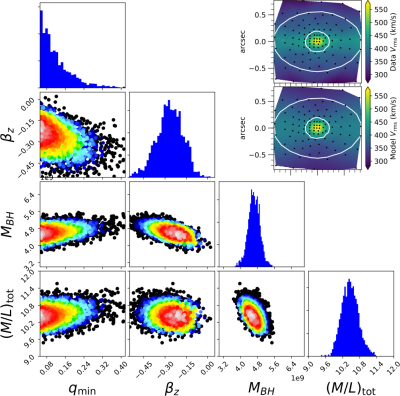 (2012) for an application of pPXF to the study of the star formation history of passive galaxies at redshift z~2. Starting with ppxf version 2016-07-27, the Python code includes the upgrade introduced in Cappellari (2017, MNRAS, 466, 798). The interface has remained fully compatible with the previous version: If you used ppxf before, you do not need to modify your scripts to benefit from the improvements. The source code of the ppxf package, with examples and instructions, is on the Python Package Index (PyPI). It was last updated on the 27 November 2018 and the changes are documented in the CHANGELOG. This version contains extra options not present in the IDL version and uses different non-linear optimization algorithms. The Python version is also faster than the IDL one (10× faster in the examples of Figure 3) when using a large number (>100) of templates, thanks to SciPy's built-in nnls (a similar pPXF performance in IDL requires calling the compiled version of BVLS: see below). How to install: Use "pip install ppxf". Without write access to the global site-packages directory, use "pip install --user ppxf". User Manual: Is available on THIS PAGE or as PDF. A good starting point for your ppxf fits are the examples contained in the ppxf/examples directory. Import Changes Needed: From ppxf version 2018-04-17, the code is distributed as a Python package. If you used ppxf before, you have to change commands like "import ppxf_util" into "import ppxf.ppxf_util". ppxf requires the scientific core packages NumPy, SciPy and Matplotlib, and the examples use Astropy to read FITS data (it was tested with Python 3.7 using NumPy 1.15, SciPy 1.2 and Matplotlib 3.0). Starting with pPXF version 2016-08-02, the IDL code includes the upgrade introduced in Cappellari (2017, MNRAS, 466, 798). The interface has remained fully compatible with the previous version: If you used pPXF before, you do not need to modify your scripts to benefit from the improvements. NOTE: The IDL version of pPXF lacks some utilities, that are only present in the Python version, to more easily interpret and visualize the stellar population and gas output. Moreover, the IDL version of pPXF can be one order of magnitude slower than the Python version, when fitting many spectral templates. The source code of the IDL program pPXF, with examples and instructions, can be downloaded here in ZIP format (2.5 MB). This version was last updated on the 2 March 2018 and the changes are documented in the program file. The pPXF package was tested with IDL from 6.4 to 8.6. The Bounded-Variables Least-Squares (BVLS) algorithm by Lawson & Hanson (1995). This is a generalization of the Non-Negative Least-Squares (NNLS) algorithm by the same authors. My IDL routine bvls.pro can be found here. Alternatively, a significant performance gain, at the expense of portability, can be achieved by calling the compiled Fortran version of BVLS using IDL's CALL_EXTERNAL. The MINPACK (Moré, Garbow & Hillstrom, 1980) Levenberg-Marquardt nonlinear least-squares optimization algorithm. The IDL routine mpfit.pro (Markwardt 2009) can be found here. pPXF is a state-of-the-art software for gas kinematics for both Python and IDL. An alternative, in IDL, consists of using pPXF in combination with GANDALF. See Oh et al. (2011) for a large-scale application of the pPXF and GANDALF combination. Please acknowledge both the pPXF (Cappellari 2017) and the GANDALF (Sarzi et al. 2006) papers if you use the two programs together. This software implements the method presented in Appendix C of Krajnovic et al. (2006, MNRAS, 366, 787) to measure the global kinematic position-angle (PA) from integral field observations of a galaxy stellar or gas kinematics. See Cappellari et al. (2007) and Krajnovic et al. (2011) for two large scale application of this software to the study of the stellar kinematical misalignment of early-type galaxies. See Davor's Krajnovic page for the related Kinemetry package. The PaFit package is on the Python Package Index (PyPI). It was last updated on the 21 May 2018. How to install: Use "pip install pafit". Without write access to the global site-packages directory, use "pip install --user pafit". PaFit requires the scientific core packages NumPy and Matplotlib (it was tested with Python 3.7 using NumPy 1.15 and Matplotlib 2.2). Like all major public packages, I pledged to drop support for legacy Python 2.7. If you are still using it, the last version supporting it is still available here (tested with NumPy 1.14 and Matplotlib 2.2). To install it, copy the package folder to a directory in the Python path. The source code of the IDL program FIT_KINEMATIC_PA, with examples and instructions, can be downloaded here in ZIP format (9 KB). This version was last updated on 2 February 2017 and the changes are documented in the program file. FIT_KINEMATICS_PA was tested with IDL from 6.4 to 8.6. NOTE: I would appreciate if you drop me an e-mail (address at the bottom) when you download FIT_KINEMATIC_PA. I would also like to know if you got the IDL or Python version. Figure 1: Fitting of the (M/L)-σ relation in the Virgo cluster using LTS_LINEFIT (taken from Cappellari et al. 2013a). The green outliers above the relation are automatically removed from the fit. They turn out to be background galaxies and for this reason they do not follow the cluster relation. This software implements the method presented in Sec. 3.2 of Cappellari et al. (2013a, MNRAS, 432, 1709) to to perform extremely robust fit of lines or planes to data with errors in all variables, possible large outliers (bada data) and unknown intrinsic scatter. The code combines the Least Trimmed Squares (LTS) robust technique, proposed by Rousseeuw (1984) and speeded up in Rousseeuw & Driessen (2006), into a least-squares fitting algorithm which allows for intrinsic scatter and errors in all coordinates. This method makes the fit converge to the correct solution even in the presence of a large number of catastrophic outliers (like in Figure 1), where the much simpler σ-clipping approach can converge to the wrong solution. The LtsFit package is on the Python Package Index (PyPI). It was last updated on the 21 May 2018. How to install: Use "pip install ltsfit". Without write access to the global site-packages directory, use "pip install --user ltsfit". LtsFit requires the scientific core packages NumPy, SciPy and Matplotlib (it was tested with Python 3.7 using NumPy 1.15, SciPy 1.2 and Matplotlib 3.0). The source code of the IDL programs LTS_LINEFIT and LTS_PLANEFIT can be downloaded here in ZIP format (9 KB). This version was last updated on the 26 July 2017 and the changes are documented in the program file. LTS_LINEFIT and LTS_PLANEFIT were tested with IDL from 6.4 to 8.6. NOTE: I would appreciate if you drop me an e-mail (address at the bottom) when you download LTS_LINEFIT and LTS_PLANEFIT. 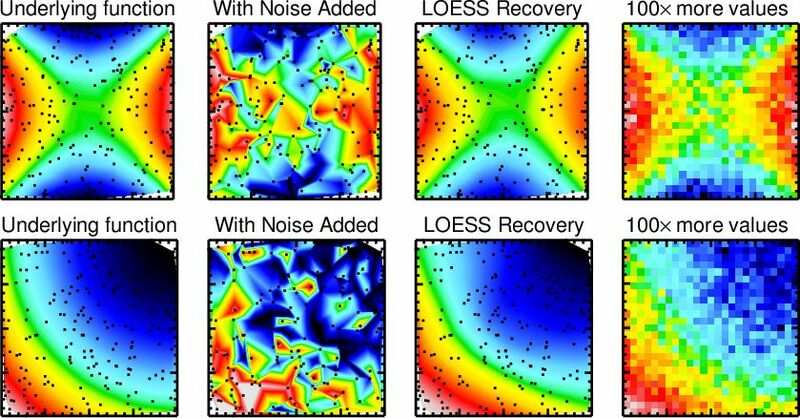 Application of the CAP_LOESS_2D routine (with FRAC=0.6) to the recovery of two underlying functions from a noisy distribution of 200 scattered values. For comparison, the right panels show the distribution obtained via simple averaging on a grid, but using 100× more values than the ones used for the LOESS recovery. The LOESS approach achieves a comparable result while requiring a much smaller number of input values. This software provides an improved implementation of the one-dimensional (Cleveland 1979) and two-dimensional (Cleveland & Devlin 1988) Locally Weighted Regression (LOESS) method to recover the mean trends of the population from noisy data in one or two dimensions. It includes a robust approach to deal with outliers (bad data). These programs were implemented and used to produce the two-dimensional maps and the one-dimensional mean trends in Cappellari et al. (2013b, MNRAS, 432, 1862). The loess package is on the Python Package Index (PyPI). It was last updated on the 21 May 2018 (it was tested with Python 3.7 using NumPy 1.15 and Matplotlib 2.2). How to install: Use "pip install loess". Without write access to the global site-packages directory, use "pip install --user loess". Also required to run the 2D example is my plotbin package (automatically installed by pip). The source code of the IDL programs CAP_LOESS_1D and CAP_LOESS_2D can be downloaded here in ZIP format (6 KB). This version was last updated on 31 October 2013 and the changes are documented in the program file. CAP_LOESS_1D and CAP_LOESS_2D were tested with IDL from 6.4 to 8.6. NOTE: I would appreciate if you drop me an e-mail (address at the bottom) when you download the code. Figure 1: Corner plot for the posterior of the model parameters obtained when fitting the black hole mass in the galaxy NGC1277 using the jam modelling method and the AdaMet Bayesian code (taken from Krajnovic et al. 2018). The Python code to produce this figure is included in the jam package above. This AdaMet package is the implementation of Cappellari et al. (2013a, MNRAS, 432, 1709) of the Adaptive Metropolis algorithm of Haario (2001). In many real-world applications, it was found to be more efficient and robust than the emcee approach, whose warm-up phase scales linearly with the number of walkers. For this reason, and because of its didactic value, the AdaMet code is provided here as an alternative. The user-friendly AdaMet package is on the Python Package Index (PyPI). It was last updated on the 21 May 2018 (it was tested with Python 3.7 using NumPy 1.15 and Matplotlib 2.2). How to install: Use "pip install adamet". Without write access to the global site-packages directory, use "pip install --user adamet". Also required for plotting is my plotbin package (automatically installed by pip).